Announcing an award-winning superstar sure to set the landscape ablaze with color and beauty from mid to late spring. Rock Star stuns with raspberry-rose standards and pale apricot falls edged and speckled in the same pinkish hue. The fragrant blooms are showy and beautiful, setting the stage for a flower-filled display in borders, cutting gardens or mixed perennial beds. Flowers appear in mid spring, and again in late summer. It naturalizes well, reliably reappearing in the landscape in greater numbers and with increased vigor year after year. For best results, plant in well-drained soil in a full to partly sunny space. 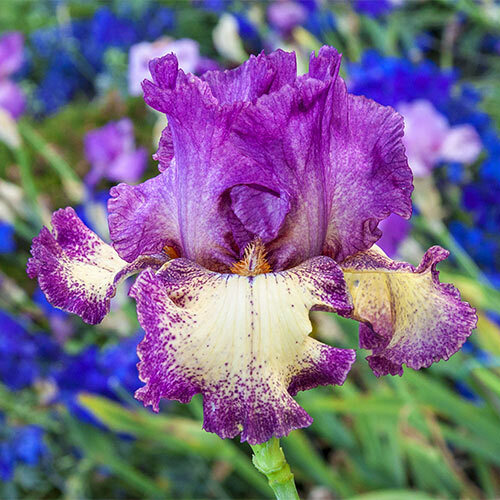 Deer won't bother this German Iris, leaving plenty of flowers for customers to enjoy. 4.5-5" flowers are fan-shaped, with three drooping petals called falls and three upright petals called standards.